Our aim is to enable all schools within the alliance to work collaboratively and, through support and challenge, to improve and maintain strong outcomes. We are a collaborative group of schools, working with university partners, Babcock Prime School Improvement Services for Worcestershire County Council, National Education Consultants and a National Leader in Education (NLE) to provide support and challenge for each other. provide high quality school to school support, particularly to schools in most need. 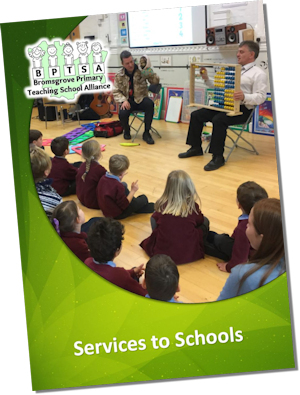 For our latest information on Initial Teacher Training, Professional Development and School to School Support please download our brochure. We are a diverse group of schools with learning and teaching at the heart of everything we do. We work with schools in Bromsgrove district and beyond to maintain and develop strong educational outcomes for children in our schools.